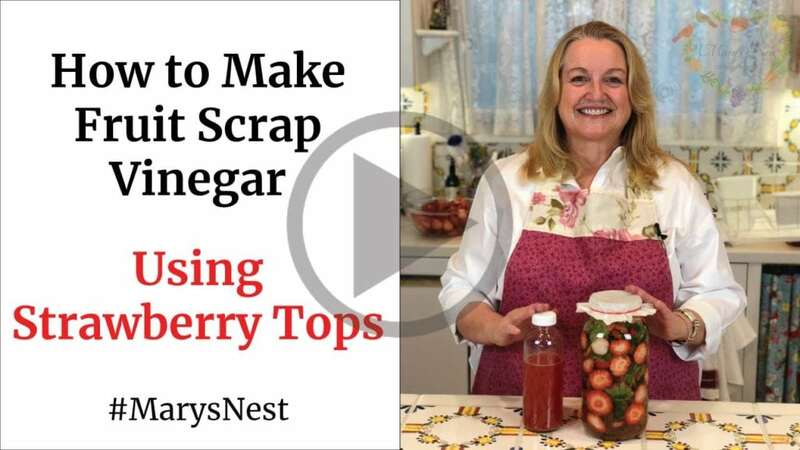 Discover how to easily make fruit scrap vinegar using strawberry tops. Making vinegar from fruit scraps is so easy—and it basically costs you nothing. You can make vinegar from items you might throw out or throw into the compost pile. So next time you are cutting up some fruit, save the scraps and make vinegar. In the video above, I’ll show you how. 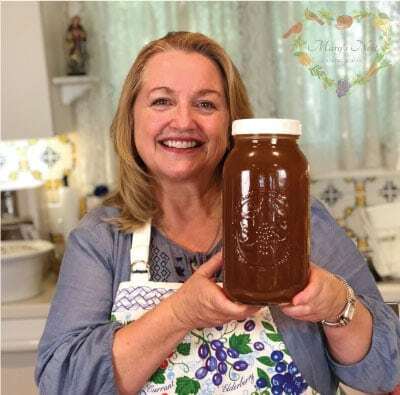 And a nice side benefit…the jar will look lovely sitting on your kitchen counter while it turns into vinegar! 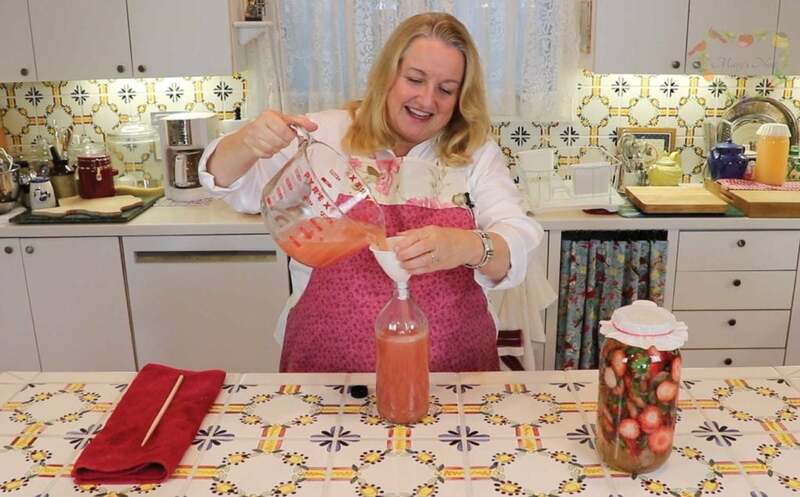 So be sure to watch the YouTube video above as I walk you through the step-by-step process for making Fruit Scrap Vinegar using Strawberry Tops. Making vinegar from fruit scraps is so easy—and it basically costs you nothing. You can make vinegar from items you might throw out or throw into the compost pile. So next time you are cutting up some fruit, save the scraps and make vinegar. Add the fruit scraps to a 1/2 gallon glass jar. Fill jar with spring water. Stir well and cover jar with a coffee filter or clean cloth and secure with a rubber band. Stir contents of jar daily. A wooden toothpick can be useful for this purpose. After a few days, add the remaining 1/4 cup of sugar to the jar and stir well to incorporate. Continue to stir contents of jar daily. After 30 days, vinegar should have developed. Test by smell, taste, or using a pH strip. If you use a pH strip, you are looking for a pH of lower than 4.5. Once you are satisfied with the taste of the fruit scrap vinegar, strain out the fruit and decant the vinegar in a clean glass bottle with a top. 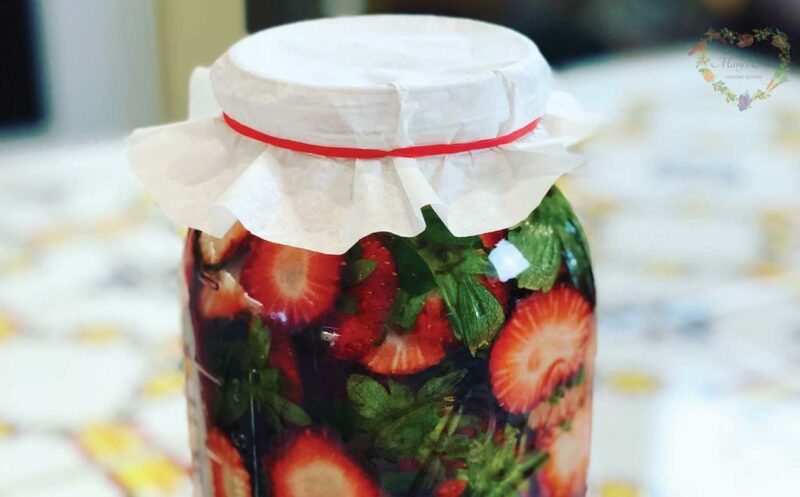 This fruit scrap vinegar is multipurpose. It can be used to make salad dressing, for cleaning, or as a hair rinse mixed with water. 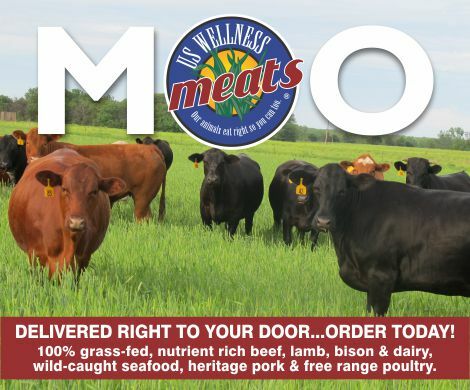 It is not recommended for canning or pickling purposes as the pH value is not standardized.